Tonight Chutney Challenged hosted a somewhat impromptu viewing party, focused around Wisconsin Gov. Scott Walker’s State of the State address. I fantasized, briefly, about making ragda patties. Then I realized that would be a crazy-making amount of work on one night’s notice. I decided on bhel puri. I decided on this over pizza because while my record-low blog readership hasn’t generated much buzz about my trial run as America’s Next Chaat Chef, my big mouth has. Once a few friends know you make “Indian food” no Pizza Hut kajillion calorie $12.99 special will do. So I made bhel puri with a new mix, pictured below. I whipped up some green chutney, chopped the cilantro, onion, tomato, diluted the tamarind chutney with lime juice and a bit of water. Then it was showtime. Let me tell you, the speech was a bunch of warmed-over talking points about tools, mining jobs, budget cuts and cheap digs at Washington D.C. and “the federal level.” If you want a more detailed analysis of the address please give me a day or so but, really, I can’t promise you anything. But the bhel puri was a winnah!!! I think it was the new mix and my total commitment to super-saucing the bhel. I added lots of chutney. That bowl of puffed rice and chaana glistened and hissed at me like a mildly angry cat in a glitter collar. Bhel puri has never spoken to me like that before. The gals on the couch were ready for a second bowl of bhel before Scott Walker could even say “our reforms are working.” Also, those reforms are not working. Actually, they are not reforms. More like taking money from school kids, or taking tamarind chutney from bhel puri. That’s the best “no” I’ve heard in a while. 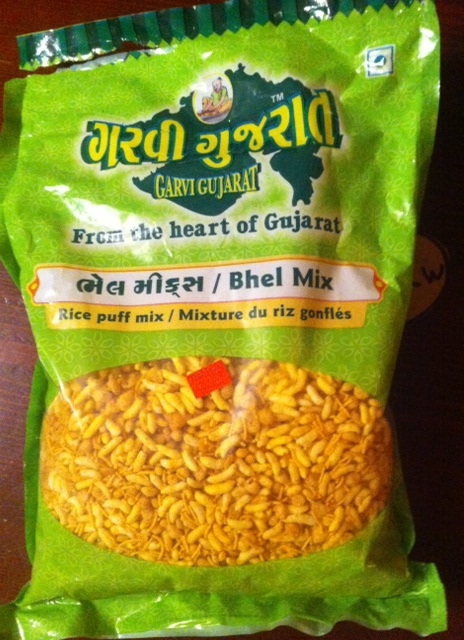 This is the bhel mix I’ve been waiting for. I admit it. I have been lazy, American, uninterested these last ten years. Hindi and Gujarati words have driven dialogue and dining menus in my home for the last ten years. “Puri” “pani” “chaat” “mehti” “asafoetida””ghatia” “dahi” have been part and parcel of family conversations, but I am only just now trying to appreciate these words, understand how they fit together, meld them into menus through my own two hands. This is the kind of revelation that belongs at the beginning of a blog, but here we go, better late than never. We are making chaat. This just dawned on me. Mumbai street food is not a bad, slangy shorthand for these street-corner delicacies. But when you’re googling recipes, buying groceries and talking up your kitchen endeavors, it’s good to know that this is chaat, many things are chaat, and the vocabulary, texture and flavors of chaat are to some degree interchangeable. Chaat. It has its own masala, its own vocabulary. Its own blogs! Here it’s seen with chutney, raw vatana, sev, red chili powder and banana chips. So you’ve had bhel puri. It’s a chaat. You’ll recognize the mint and tamarind chutneys of bhel puri and ragda patties in subsequent chaat recipes. In a few hours, I’ll be boiling potatoes and dicing tomatoes for sev puri. It’s primary difference from other puri-based chaats? Sev, and lots and lots of it. The potatoes can be dressed on their own, or joined with chickpeas as the sev puri base. From what I can tell, top the concoction with “curd” (that’s plain yoghurt) and it becomes dahi puri. I will leave you for now. My dad is here. He says he won’t read my blog. He’s not much of an “internet reader,” so I understand. 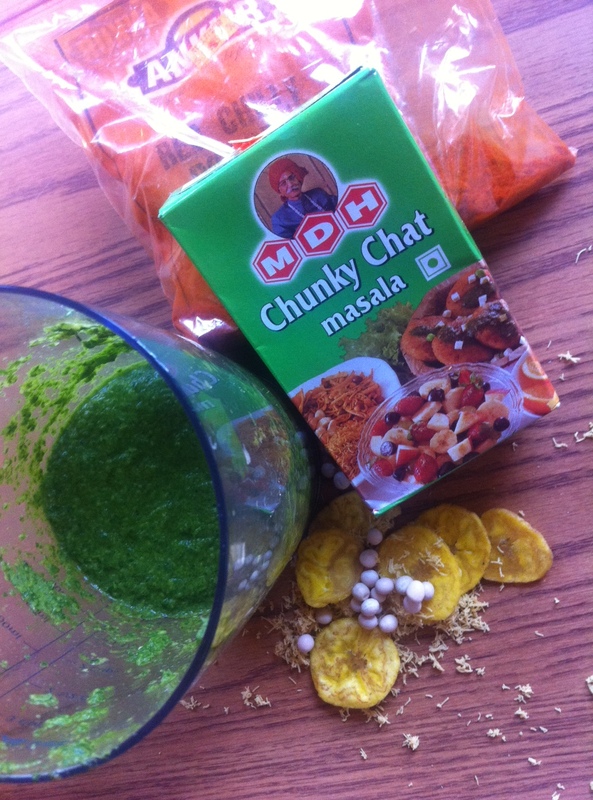 So I’m going to make him sample the new mint-coriander chutney recipe I blended up last night. Chutney recipes. I need to post those. After trying to make it on my own with a coriander-only recipe, I have got to say it: use the mint. Recipes to follow. Sooner. Maybe later.